On July 15, 2017, at approximately 00:25am, Kalamazoo Public Safety Officers responded to 200 W South St, Bronson Park for a medical rescue. A citizen was on her way to Bronson hospital when her water broke and she began to give birth. 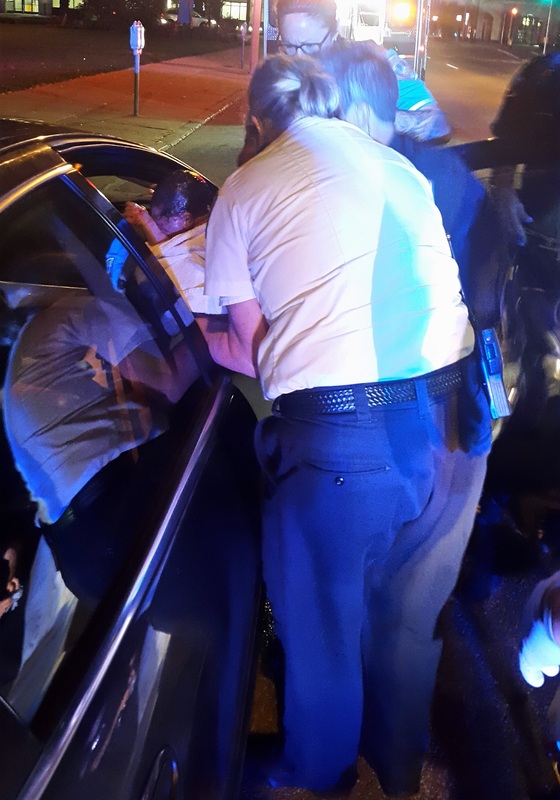 The driver pulled over on W South St and several officers responded to assist with the medical call. KDPS Sgt Kristie Hofer was one of the first officers to arrive and recognized the female was having contractions and the head of the baby was beginning to “crown”. Sgt Hofer and PSO Fountain delivered the healthy baby boy as Life Paramedics arrived. The mother and father of the newborn baby were transported to the hospital by Life. Kalamazoo Public Safety would like to extend our best wishes to the Baker family on the birth of their healthy baby boy. On September 14th, 2016 at about 1749 hours, Kalamazoo Public Safety Officers were dispatched to the area of Bronson Park located at 200 W South St regarding the larceny of a cell phone that had just occurred. The caller provided a detailed description of the suspect as he was leaving the area. Multiple uniformed officers were in the area when the crime was reported and within minutes the suspect was located in the 500 block of N Park. The suspect fled from officers on a bicycle and threw the stolen cell phone into the roadway on N Park where it was run over. The suspect fled through several yards before falling off the bicycle and continuing to flee on foot. The suspect was taken into custody near N Park and Frank St. The damaged cell phone was returned to the owner. The bicycle the suspect was riding was found to be stolen from an area jurisdiction, it too was returned to its owner. The suspect, a 15 year old resident of Kalamazoo was lodged at the Kalamazoo County Juvenile Home on several charges including larceny from a person and resisting and obstructing police. The suspect had reportedly just been released from custody in the past few days for a similar crime. The Kalamazoo Department of Public Safety has been in on-going planning for the advertised Black Lives Matter Event scheduled for Friday July 22, 2016 at Bronson Park from 6pm-8pm. From the onset we have reached out to open the lines of communication with the organizer in an attempt to clearly understand their intent and to facilitate a peaceful event. We have been able to gather some information through an intermediary which has been somewhat limiting. We do know there will be some type of “Shutdown” to be conveyed at the event and we have attempted to get clarity on that but to no avail. There was some initial information the “Shutdown” may occur on the Kalamazoo Mall and also may include the blocking of traffic and streets. There is voluminous social media activity, blog comments to news articles etc. that contribute to the complexity of planning and responding to the event. While initially labeling the rally a “Peaceful Event” the tenor has changed over the last 48 hours based on updates posted to the event Facebook page (https://www.facebook.com/events/1754263754850064/). KDPS communicates all of this as to advise our Citizens of what we know, what we don’t know, and to provide relative context to this fluid situation. Our officers are prepared to address and react to the circumstances with professionalism and measure and certainly wish for a peaceful conclusion.